Dry cured Calabrian pork sausage with chilli pepper taste and fennel seeds. Outdoor raised Calabrian black pigs. High content of omega 3, 6 and omega 9. 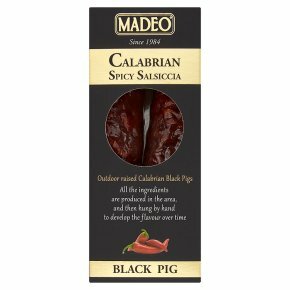 Allergen and preservatives free.This Salsiccia is made using a local ancient breed of Black Pigs, which are raised outside to develop the flavour. The meat is then mixed with Calabrian Picante Chillies & Wild Fennel and is filled into a Natural casing and then hung by hand to let the flavour develop over time. Remove from packaging 30 minutes before serving, have with Bread, Olives, Cheese and Glass of wine.